Informant America: As Rick Wershe’s Parole Fate Looms, Bogus “Facts” come out of the woodwork. As Rick Wershe’s Parole Fate Looms, Bogus “Facts” come out of the woodwork. The news media, and many in the public, are finally paying attention to the story of Richard J. Wershe, Jr., a man known to many only as White Boy Rick. He’s been in prison for 29 years of a life sentence for non-violent possession of a box of cocaine when he was a juvenile. In response to a U.S. Supreme Court ruling, Michigan has paroled or allowed the re-sentencing of every inmate charged under circumstances similar to Wershe; a juvenile non-violent offender. Every inmate, that is, except Rick Wershe. He has been in prison longer than some murderers, because he told the FBI about politically connected police corruption in Detroit. As his attorney says, he told on the wrong people. In a very real sense he’s a political prisoner. His continued imprisonment is part of a vendetta by a corrupt criminal justice system in Michigan. With the newfound attention to the Wershe case, there are claims of “facts” that simply aren’t true. This blog post will profile one example. One day recently, retired Detroit Police Sgt. John Simon was interviewed by WDIV-TV, Channel 4 in Detroit and he claimed he was Rick Wershe’s arresting officer and that he now believes Michigan’s longest-serving juvenile prison inmate doing time for a drug case doesn’t deserve his harsh sentence. It sounds good, but there’s one problem: the tale Simon told the TV station doesn’t match the official court record from Rick Wershe’s 1988 Recorders Court trial. I have the trial transcript, all 32 pounds of it. I’m going to share a bit of it in this blog post. I will focus on the opening argument of the prosecutor. I expended considerable effort to obtain the Wershe trial transcript for a book I am writing about Rick Wershe and the War on Drugs. 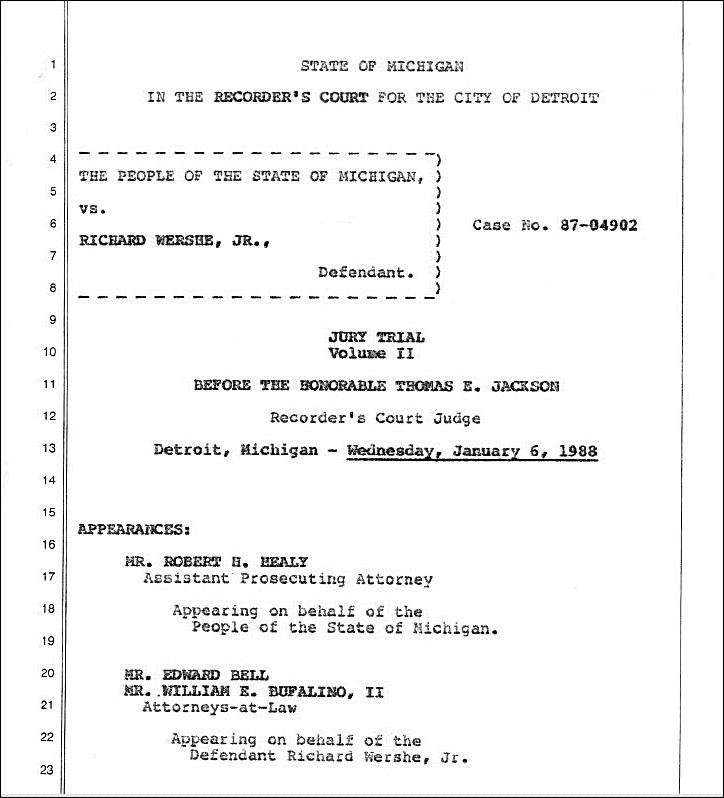 Cover page from a volume of the transcript of the Rick Wershe, Jr. drug trial in 1988. One of Rick Wershe’s enduring problems over the years has been bogus information reported as fact in the media. It has contributed to his reputation—a legend—and like most legends, a lot of it isn’t true. Judges, prosecutors—and Parole Board members—read or watch this stuff, just like everyone else, and it makes an impression. Often, it’s a bad impression that isn’t supported by the facts. Some of what Simon told the TV station is correct, such as his observation that young Rick Wershe was known to the police. As a young teen, Rick Wershe, Jr. was on the wild side. In blunt terms, he was a juvenile delinquent with no parental supervision. His parents were divorced, his father had custody of Rick and his sister, Dawn, but Richard Wershe Sr. was seldom around. Rick Wershe, Jr. raised himself, for the most part. His lifelong friend, Dave Majkowski, who manages the Free Richard Wershe Jr. Facebook page, says they were always getting stopped by the police for shooting BB guns or setting off fireworks. Channel 4 quotes Sgt. Simon as saying Rick Wershe was no kingpin. He likened Wershe to an errand boy for the real big-time dope dealers. The statement that Wershe was no kingpin is true. The report quoting Sgt. Simon gets in trouble when the retired cop talks about the facts of the Wershe drug case. The station reported on its web site: "But on May 22, 1987, Simon said Wershe had 8 kilos of cocaine and a bag of cash." Rick Wershe was a passenger in a car that was pulled over near his home on Hampshire St. on Detroit’s east side by uniformed Police Officers Rodney Grandison and Jeffrey Clyburn. The car, the officers said, had been speeding through a residential neighborhood. When the officers approached the car, Wershe and the driver, Roy Grisson, got out of the vehicle. "...When Grandison gets up alongside the driver's window what he sees on the floor on the passenger’s side is...one of those shopping bags...not the paper kind, but the plastic kind—and it is stuffed full of money to the point where that plastic is stretched thin enough so that you can actually see the money through the plastic." Regarding the stated reason for the traffic stop, Rick Wershe has asked a rhetorical question on several occasions: why, he asks, would we be speeding, risking police attention, with a large amount of money in the car? He's not disputing there was a bag of money in the car. He's questioning whether the police made up a reason for doing the traffic stop. In other words, he encourages observers to wonder if the police lied about their reason for doing the traffic stop. This implies they were lying in wait, that they were determined to arrest Rick Wershe and invent a charge if need be. The money wasn't in Rick Wershe's possession. It was on the floorboard of the car. It could have belonged to Rick's friend, Roy Grisson. Or to someone else entirely. Being near a bag of cash doesn't mean you have it in your possession. Wershe was standing outside the car when Officer Grandison sees the bag of money on the floorboard of the vehicle. It may seem to be a small point, but in a trial where the sentence is mandatory life, it is not a small thing. Healy doesn’t mention any drugs to the jury because, at this point in the incident, there’s no sign of any drugs. But, according to Sgt. Simon, as quoted by the TV station: Wershe had 8 kilos of cocaine and a bag of cash." "Police said Wershe was carrying two bags, one filled with money, one filled with drugs," the TV station reported. This is wrong on both counts. As noted above, Wershe was not carrying the bag of cash at any time during the incident with the police. It was on the floorboard of the car and it was grabbed by his father and sister in a scuffle with the police, not by Rick Wershe. And he did not have a bag of dope. Period. As we shall see, the police claim the drugs were in a large box, not a bag. And they never actually saw Rick Wershe with the box, a fact the prosecuting attorney admitted to the jury. It should be noted Assistant Prosecutor Healy’s opening statement to the jury was not exactly a recitation of facts and truth, either. Healy misled the jury because the police misled him. Healy claimed the police officers didn’t know Rick Wershe, Jr.
"They will testify they don't know young Wershe from anybody. They never saw him before, didn't recognize him," Healy told the jury. That is flat-out false, but Healy didn't know it because the police lied to the trial prosecutor, too. The officer who arrested Wershe knew him and knew him well. That officer lied under oath on the witness stand. There's proof. After Wershe went to prison, the FBI approached him and asked him to help them with a covert sting operation intended to catch corrupt cops. As part of the discussion, Rick Wershe told FBI Special Agent Herman Groman that Officer Grandison had committed perjury—lied—when he testified at the Wershe trial that he didn’t know the young man he had arrested. Agent Groman arranged with prison officials to have Wershe make a tape recorded call to Officer Grandison at his home. It was a pretext call that lasted 15 or 20 minutes. It is quite evident from the recorded conversation that Wershe and Grandison were/are well acquainted. Wershe says Officer Grandison invited him to his home on a number of occasions to smoke weed, before Wershe was arrested by Grandison in May of 1987. 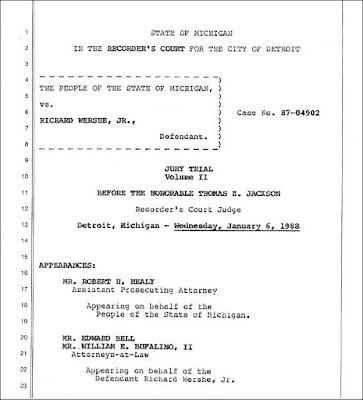 Grandison was not indicted in the FBI police corruption case and the Michigan Court of Appeals was not interested in considering Wershe’s appeal, even though the FBI had audio tape evidence that Officer Grandison committed a felony and gave false testimony under oath at the Wershe drug trial. Let’s return to Healy’s opening statement of “facts” to the jury. "Grandison goes out between the houses onto Camden and he sees over here (pointing to a diagram) on the north side of Camden the defendant (Wershe) who is in the front yard of that address and he is at the front porch. Grandison then goes over and arrests the defendant, and takes the defendant back to Hampshire." There is no mention of Sgt. John Simon by Healy. In fact, he was not on the witness list for the trial at all; a strange omission if he had arrested Rick Wershe that night. In fact, as Healy told the jury, Grandison was the arresting officer. "Now, that's the first mention you're going to hear from any witness who testifies in this case of a box of that description," Healy told the jurors. He continued: “There's no mention of seeing a box of that description in the car that is stopped by Grandison and Clyburn, and you’re not going to hear any testimony from a witness who knows where the box came from. So, you might as well get used to that idea right now." The Wershe trial transcript stands in contrast to the recent TV station report that, “Wershe was carrying two bags, one filled with money, one filled with drugs,"
Channel 4 quotes Sgt. Simon as saying the eight kilos of cocaine related to the Wershe arrest “filled up the front seat of my car." Here again, Sgt. Simon’s story is totally at odds with the trial record. Assistant Prosecutor Healy told the jury a box was found in the back yard of a house on Camden, a block away from the Wershe traffic stop, and James Storey, the head of the household, was fearful when he realized the box contained packages of cocaine. "...and they respond to (the Precinct) and they are there at the time this phone call comes in." Hmm. Really? Let's break this down and think about it. Why were the Task Force cops notified to come to the police precinct? By Healy's own statement to the jury, up to this point the cops have the Wershe family in custody, a bag of cash, but no dope. Just a bag of cash. Who the cash belongs to hasn't been established and, in any event, having a bag of cash is not a crime. According to Prosecutor Healy, the phone call about "the box" is just coming in, but the special Task Force narcs are there when it happens, for some unknown reason. So why were the Task Force narcs notified to appear at the police Precinct station before there was any indication drugs were involved in this arrest? It took them some time to get to the precinct station. Yet they were there when the call from James Storey came in, reporting a box of dope had been found. It is reasonable to wonder why a special Task Force team of narcs would be called to come to the precinct station, since there were no drugs involved at that point. Wershe’s defense attorney didn’t challenge it. Neither did the judge. There are many things in Wershe's drug trial that don't add up. It was not, as they say, a slam-dunk case. If Wershe had had better defense counsel he likely wouldn't be in prison today. "(The) members of this Task Force, they go to Storey's house. And they get there, and as they pull up, Mr. Storey comes out (of) the door and he's got the box. The box is taken by police officer Greg Woods of the Detroit Police Department Narcotics Section." Compare that to Sgt. Simon’s recent TV interview statement: (the 8 kilos) "filled up the front seat of my car." If that were true Sgt. Simon would have, without question, been a trial witness. He wasn’t. Prosecutor Healy said Detroit Police narcotics officer Greg Woods took custody of the box of narcotics. There is an issue in criminal law called chain of custody. Sgt. John Simon’s claim that the box of drugs "filled up the front seat of my car" would have been a chain of custody issue. He would have been called to testify what he did with the dope after it "filled up the front seat" of his police patrol car. Simon's claim is not supported by the trial record. All of this is not to say Sgt. Simon wasn’t at the scene that night. As a patrol sergeant, he did make the scene. Rick Wershe says that much is accurate and he even claims his sister, Dawn, spit at Simon during the confrontation in the street. Simon apparently joined a bunch of other cops who responded to calls for help from Officers Grandison and Clyburn. Simon may have been there that night, but the trial transcript shows he has, um, embellished his role to a considerable degree for a TV interview. He didn't arrest Wershe and he didn't have custody of the box of drugs. The Detroit Police 911 recording system just happened to malfunction at the time the James Storey call about the box of dope came in to the police precinct desk, or so the police claim. That was their explanation for why they couldn’t produce a tape of the phone call about the box of drugs at trial. Rick Wershe’s fingerprints and palm prints were not found anywhere on the box containing the eight kilos of cocaine. Nor were his prints found on the packages of cocaine. Reporters and editors are notoriously thin-skinned when it comes to criticism. I’m regarded by some as a jerk and far worse for pointing out falsehoods reported as fact in the Wershe saga. But journalistic errors and mistakes have real-world consequences. The media-fueled legend of White Boy Rick has been largely responsible for keeping Richard J. Wershe, Jr. in prison for nearly 30 years. It's a fact that Channel 4's Kevin Dietz has done a far better job than most Detroit reporters - print and broadcast - in reporting on Rick Wershe. The others know it. They watch and read his stuff. They have a habit of copying his reporting, rearranging a few words, and acting like it's their own reporting. Here's why it matters: if Channel 4 reports Rick Wershe had a bag of cash and a bag of dope when he was arrested, a whole bunch of other "reporters" are going to spread that around and add to the deeply flawed White Boy Rick legend. It's called herd journalism or pack journalism and it has damaged Rick Wershe badly over the years. Over the course of nearly 90 blog posts Informant America has shown over and over that routine media descriptions of “White Boy Rick” as a “drug lord” and “kingpin” are not supported by any facts. These false descriptions have had a corrosive effect on public opinion and that has deprived a man of his freedom for most of his adult life. For his part, Rick Wershe tries to look on the positive side and tries to get along with a growing number of very competitive reporters who are interested in his story. When I sent Wershe an email telling him about the fact-challenged interview with Sgt. Simon, Wershe replied, "...either way it's another cop saying i (sic) was not what they made me out to be!!!" The Michigan Parole Board, on June 8th, is going to give Rick Wershe serious consideration for parole for the first time in nearly three decades. They've scheduled a public hearing in Jackson, Michigan. It’s about time reporters get the story straight.